Aside from the court and the baskets, the basketball is the only piece of equipment necessary to play the game of basketball. During the game, the ball must be bounced continuously (dribbling), thrown through the air to other players (passing) or thrown towards the basket (shooting). Therefore, the ball must be very durable and easy to hold on to. The ball is also used to perform tricks (sometimes called freestyling), the most common of which are spinning the ball on the tip of one's index finger, dribbling in complex patterns, rolling the ball over one's shoulder, or performing aerobatic maneuvers with the ball while executing a slam dunk, most notably in the context of a slam dunk contest. 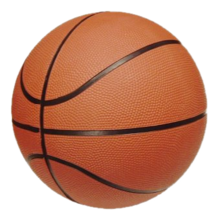 Nearly all basketballs have an inflatable inner rubber bladder, generally wrapped in layers of fiber and then covered with a surface made either from leather (traditional), rubber, or a synthetic composite. As in most inflatable balls, there is a small opening that allows the pressure to be increased or decreased. The surface of the ball is nearly always divided by "ribs" that are recessed below the surface of the ball in a variety of configurations and are generally a contrasting color. 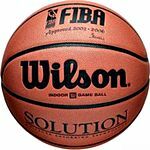 A brownish surface with black ribs and a possible logo is the traditional color scheme of basketballs but they are sold in various colors. Balls are generally designated for indoor (generally made of leather or absorbent composites), or all-surface use (generally made of rubber or durable composites, also known as indoor/outdoor balls). Indoor balls tend to be considerably more expensive than all-surface balls due to cost of materials. In addition, brand new all-leather indoor balls must be "broken in" first to achieve optimal grip before use in competition. The abrasiveness of asphalt and the dirt and moisture present in an outdoor setting will usually ruin an indoor ball within a very short period of time, which is why an indoor/outdoor ball is recommended for recreational players. Outdoor balls are commonly made from rubber to cope with rougher conditions, and they need to be filled with more air to retain a suitable level of air pressure in colder weather. 20–23 oz] Men and boys ages 15 and up. This is the official size for men's high school, college, and professional. 18–20 oz] Boys ages 12-14. Women and girls ages 12 and up. This is the official size for women’s high school, college, and professional. 17–18 oz] Boys and girls ages 9-11 years old. This is the standard youth basketball. 4 Youth (North America) 25.5 in (65 cm) 14 oz (400 g) Boys and girls ages 5-8 years old. 3 Mini (North America) 22.0 in (56 cm) 10 oz (280 g) Boys and girls ages 4-8 years old. Also known as “mini” basketball. Note that the ball used for all competitions (men's, women's, and mixed) in the formalized halfcourt game of 3x3 combines characteristics of the size 6 and size 7 balls. Its circumference is that of a size 6 ball, but its weight is that of a size 7. In early December 1891, the chairman of the physical education department at the School for Christian Workers (now Springfield College) in Springfield, Massachusetts, instructed physical education teacher James Naismith, to invent a new game to entertain the school's athletes in the winter season. Naismith assembled his class of 18 young men, appointed captains of two nine-player teams, and set in motion the first ever basketball game, played with a soccer ball and two peach baskets tacked to either end of the gymnasium. The first purpose-built basketballs were made from panels of leather stitched together with a rubber bladder inside. A cloth lining was added to the leather for support and uniformity. A molded version of the early basketball was invented in 1942. For many years, leather was the material of choice for basketball coverings, however in the late 1990s, synthetic composite materials were put forth and have rapidly gained acceptance in most leagues. From 1967 through 1976, the American Basketball Association (ABA) used a distinctive red, white and blue basketball that is still seen from time to time. Spalding was the first company to produce a basketball for official use. Company founder A.G. Spalding made the first dedicated basketball in the last years of the 19th century at the behest of James Naismith. It has produced basketballs since that time and has produced the NBA’s official game ball since 1983. They also produce the basketballs for the WNBA and NBA Development League. The company also produces a wide variety of balls for the consumer market. In 2012, it also became official provider for both the Euroleague and Eurocup competitions. It also serves as provider for Liga ACB. Spalding became the new supplier for NBL Australia in 2010. All International Basketball Federation (FIBA) world championships and continental qualifying events. Many domestic leagues, including NBL Australia, Argentina, Uruguay, British Basketball League, France (women), Greece, Indonesia, Italy, Lithuania, the Philippines, Poland (women's), and Portugal. Until the 2006–07 season, it had provided balls for both Europe-wide competitions organized by Euroleague Basketball, the Euroleague and ULEB Cup (now the Eurocup). Molten's top-of-the line product is the GL7, a leather ball with a distinctive 12-panel design. Wilson Sporting Goods is the official ball supplier of all NCAA postseason tournaments, most notably the men's and women's Division I tournaments, and is used by many NCAA teams during the season as well by many high school leagues. As of 2015, Wilson also supplies balls for all FIBA-operated 3x3 competitions. Like Spalding, Wilson produces a variety of balls for the consumer market as well. Rawlings has manufactured basketballs since 1902. The company is known for producing a 10-panel ball (known as the TEN), along with traditional 8-panel balls. The TEN basketball is the official ball of the Amateur Athletic Union and the "Gus Macker", the largest 3-on-3 basketball tournament in the United States. 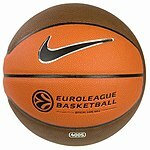 Nike had the contract to produce balls for the Euroleague Basketball Company (including the Euroleague and the Eurocup) from 2007 until 2012, when it turned to Spalding. In the Philippines the NCAA and UAAP use the Nike 4005 Official Tournament Balls. Include: Adidas, Avaro, Baden Sports (official supplier for the Harlem Globetrotters), Dunlop, Kipsta, Mikasa, Mitre, Nivia, and others. Wikimedia Commons has media related to Basketball balls. Look up basketball in Wiktionary, the free dictionary. ^ Zirm, Jordan. "Basketball Sizes: A Quick Guide for All Levels of Play". STACK. Retrieved 2017-05-05. ^ Putman, Carl (September 11, 2017). "Basketball Official Size & Weight". LiveStrong.com. Retrieved 2018-02-02. ^ "Sports Gear Lab". Sportsgearlab.com. Retrieved 31 May 2016. ^ a b c d "Basketball Size Chart - Recommended Sizes for Mom & Me". www.breakthroughbasketball.com. Retrieved 2017-05-05. ^ a b c d e f g h "Official Basketball Rules 2018 - Basketball Equipment - Valid as of 1st October 2018 (working document)" (PDF). FIBA. 1 October 2017. pp. 11–12. Retrieved 31 March 2019. 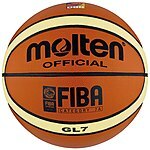 ^ a b "Wilson to provide the Official Game Ball for FIBA" (Press release). Amer Sports. 9 June 2015. Retrieved 17 August 2015. ^ "Basketball Australia to Play Ball with Spalding Through to 2019". Basketball Australia. August 10, 2016. Retrieved 2018-02-02. ^ "Euroleague Basketball Announces Partnership with Nike". Euroleague Basketball. 2007-06-28. Archived from the original on 1 July 2007. Retrieved 2007-07-02.